Muy linda vivienda, agradable y funcional. Esta muy bien ubicada, cerca de los supermercados, de las tiendas, con el metro a 5 minutos andando y el bus directo al Coliseo. Se puede alcanzar facilmente los sitios de interés de Roma. 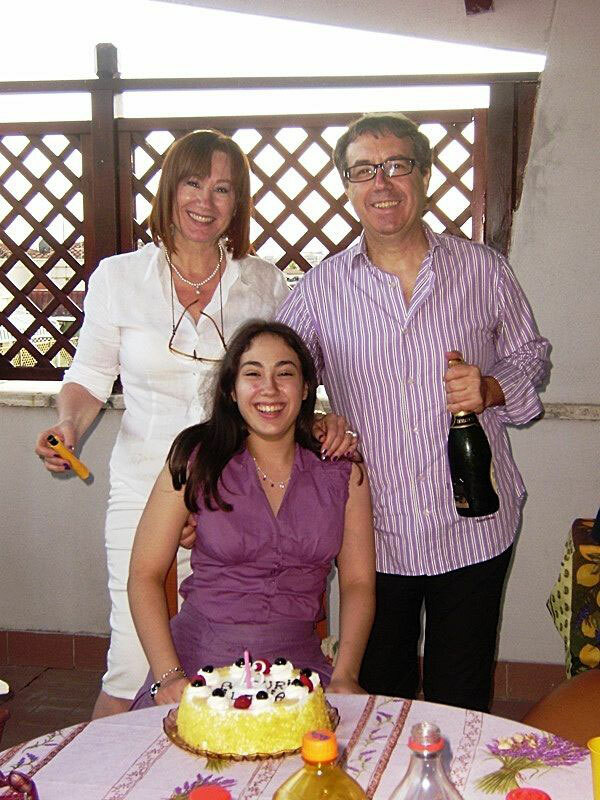 Gracias a Rossana e Domenico que se han encargado de todo. Una casa 5 estrellas... tomando en cuenta el dinamismo, la amabilidad y la comida. Saludos desde Ecuador. Grazie. Gracias. Rossana was an excellent host. Very kind and helpful. The loft is located 600 mts from Furio Camilo metro A station, 15 min ride from main downtown district. Bus stop also available at 150 mts. Great loft for single travellers or couples. Nicely decorated. Gracias por esta linda estadía. Espero volver a Roma en 2017 con mi novia. Al the basic needs and much more were available, friendly and helpfull owners, good connection with the centre of Rome. Very good location; easy to get to metro or bus (nearly to flat); nearly to supermarkets (one 3 minutes from the flat, second one 10 min, next to metro); the flat small but enough for couple, clean and comfortably. Good location, supermarket nearby, very comfortable apartment, with good security. The apartment is small was clean an has everything you need, we loved it. There is a metro station just 5 mins walk to take you to Termini central where there are buses to all of Rome or to other metro connections. If you purchase a Roma Pass the all these are free. Rossana, the host was really helpful providing all the information you will need. There is a Carrefour very close by also a Celiac supermarket where you can buy Gluten free foods. Jus around the corner (two min walk there is a Tratoria restaurant, run by a mother and son, fantastic food at very reasonable prices. “Authentic Rome Experience Rossana and her husband kindly met us at the apartment and shared a lot of information about the local area and the sights of Rome. Although the apartment was outside of the central 'tourist area,' it was only a 5-10 minute subway ride away from the main sights. The area certainly gave a sense of the daily lives of people who live in Rome, and it was a comfortable place for 2 people to stay." " PERFECT! a holiday home equipped with everything, clean, quiet. the subway a few steps, full of restaurants, bars. Rossana is a hostess helpful and polite, we did find a map of Rome. thanks"
" We stayed 4 nights in this flat. Rossana and her daughter were so welcoming and informative. The place is really cozy. I recommend this place. Thanks Rossana for your hospitality. I have been at domusilaria three nights with my son (8yrs) and all worked out fine. The place is small, yes, but propely thought: there is a walk-in wardrobe, which means your stuff gets out of your sight and is properly stored, a fully-operational kitchen, tv and dvd reader, a large bathroom with a huge shower. Also an additional bed is available on a raised platform (the ceiling of the storage room) and the main bed can be folded away (raised parallel to the wall, in fact) to gain space through the day (and the bed is very comfortable, not those folding beds that would kill your back!!). Washing machine and dish-washer are also built in the kitchen and there is a iron if you need to fix your clothes. The place is in a nice neighborhood, i was raised there so i know what i mean, quiet, lots of places to eat, a nice park (caffarella), some 500 meters from a line A stop (3 stops to san giovanni (shopping area, beyond the church), 6 to termini railway station, 9 to piazza di spagna, more or less 1 minute per stop) and i saw that some reviewers mentioned the local market (via gino capponi), which in fact is a 5-mins walk and is a real-roman-life experience for those that have missed it so far. Overall i think it is perfect for those of you who like to be tourists and see new places but also like the feeling of being, although for a few days only, 'part of it'. “Lovely decor, comfortable, friendly, affordable"
Rosanna greeted us with a warm welcome. The apartment is nicely decorated, well furnished and had plenty of room for my husband and me including a walk-in closet.. We shopped at the local market and ate in most evenings, finishing with a neighborhood walk and espresso. It was a wonderful place to retreat to at the end of a packed, tourist filled day with the masses. Just outside of Rome central, it is conveniently located a few blocks from the metro. If you plan on using the clothes washer, note that it can only accommodate very small loads. We would recommend this place to others looking for some quiet down time in a real local neighborhood or just for good, clean accommodations at a reasonable rate. Thanks for your lovely review. You are always welcome!!! "Our stay at this apartment in Rome was very pleasant. The host family was very helpful and accommodating. The apartment is clean and well kept. It’s got almost everything that a traveler would need so you feel right at home. Things inside the apartment are arranged quite thoughtfully so it’s cozy. We drove a rental car and curb-side parking at the neighborhood seems easy and safe. It’s only five minute walk to the nearest metro station and from there you get easy and quick access to all major attractions in Rome. We left a pair of nice chop sticks as a gift and the host gave us a much nicer espresso pot in return. How nice! I highly recommend this apartment. If I ever come back to Rome, this place would be my top choice"
This was a lovely apartment! Rosanna and her family were so helpful and kind, and made our trip much easier. The apartment was stocked with breakfast foods and some drinks and included the use of a cell phone. It was clean and in a nice neighborhood, and I would recommend it to anyone who visits Rome. The apartment is beyond fantastic! You can find all the things you need in this apartment and it is also convenient to the Metro station and various bus stops. The host is very friendly and nice. We really enjoyed our stay at this apartment. Thank Odette. You were wonderful guest. Come to visit us again soon! Thanks and good luck for your studies!!! My friends and I had a wonderful accommodation. The hosts were really nice, the apartment was clean, well equipped and cozy and not far away from the city center. We had everything we needed. I would recommend it to everyone who wishes to come to Rome and if I ever go back now I know where to stay! We were in Rome the whole family - 2 adults and 2 children ( the youngest was only 7 months). Apartments was ideal with all necessary living. Beautiful, comfortable, quiet and clean apartments. Hostess Rossana just excellent, helpful and thorough. Thanks for making the information on nearby restaurants and shops, as well as Rome's major attractions. Apartments with adjustable heating, we have a very useful, because we traveled with a baby. Good location - close to the metro, shops. Wi-fi very good. We hope to return again. Thank Rossana and her daughter.